"Grilled chicken with a sweet kick." Great recipe! I really liked the flavor. I used two cloves of garlic and a bit of extra honey. Took no time at all to put together. Thanks! This was insanely bland. It really added little flavor to the chicken. Have to say I'm surprised by the high rating. This recipe was very tasty! 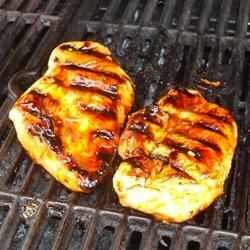 I added one cup of bottled barbecue sauce that added a new dimension to the dish.